Just simple hammocks to hang in their cage they like to sleep in. czb, sprynkles, Kittylady and 15 others like this. so which do they prefer? Kittylady, Waterslide, pinkbunnyslippers and 7 others like this. Angeli and sputnik like this. Actually, they prefer the cheap ones in the cage. Out of the cage they like empty beer or soda boxes. Ugh, and plastic bags, but they can only hang out in plastic bags when I'm watching them. We also have a stupid tent made for them of old bed linen and old sweatshirts they curl up in. There are other funny hammocks, like a banana, but not worth the price. Ha, that thing came with a ferret pirate tshirt, but they don't like clothes. They do get a weekly shower and all linen is washed once a week, or the house starts to smell a bit like skunk weed. Not that I know what that smells like ..... At least I have an excuse when people pop by unannounced that it's the ferrets that smell. denny, czb, Daphodil and 1 others like this. I thought exactly the same thing! I thought it, too. 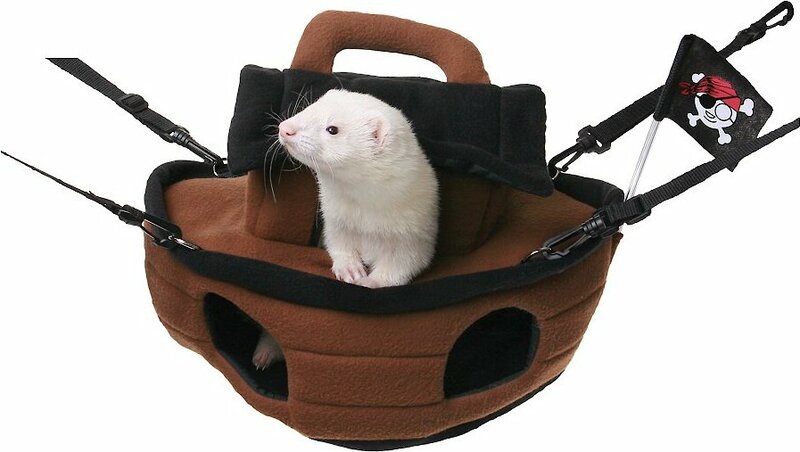 I mean I love ferrets already, but the possibility of having a pirate ferret is too adorably and hysterically tempting. Reminds to find a water hammock for my axolotls. The female one loves to hang out on top of the plants in the aquarium. I guess she needs some time off from the two boys on the ground as we all do from time to time. Kittylady, czb, Waterslide and 8 others like this. ^^ Oh my goodness those are the cutest little creatures! I bet they are fascinating to watch. OMG, they're like underwater ferrets! I did not know there would be squee overload in a thread about Jessica Simpson being pregnant. Note - I bought a suitcase on sale with the inlaws last December. It was after a champagne brunch. Came home to find out it's one of Jessica Simpson's. I still like it. Good thing her name isn't too captain obvious on it. I have two of her comforter sets and I like them very much. Very colorful, pretty patterns, all cotton and well-made. The pillow shams close with zippers which is really nice. The last set I had was Martha Stewart from Macy's and the shams had buttons which all popped off eventually. Novice, Mrs P and bootspaige like this. I'm horrible at cleaning aquariums or else I'd totally love to have a few of those! she needs to have this baby stat! Oasis, C_is_for_Cookie and ConstanceSpry like this. I was expecting to see she had the baby, not that! God, I get uncomfortable just looking at her. Poor thing. crayzeehappee, fgg, KrisNine and 1 others like this.